George McGovern, the son of a Methodist minister, was born in Avon, South Dakota, on 19th July, 1922. A highly intelligent student, in 1940 he won a scholarship to study history at the North-Western University. McGovern's education was interrupted by the outbreak of the Second World War. McGovern joined the United States Air Force in 1943 and flew 35 combat missions as a B-24 bomber pilot in Europe. During the war McGovern won the Distinguished Flying Cross. After the war McGovern returned to North-Western University where he obtained a Ph.D in history. He later moved to Dakota Wesleyan University where he taught history and political science. He became involved in politics and became an active member of the Democratic Party in South Dakota. In 1956 he was elected to Congress, and in 1960 to the Senate. The following year he was appointed director of the Food for Peace Program. In this position he oversaw the donation of millions of tons of food to developing nations. John F. Kennedy described McGovern as "the most decent man in the Senate". However, Eugene McCarthy, who shared his left-wing views, once remarked: "Talking to George is like eating a Chinese meal. An hour after it's over you wonder whether you really ate anything." In 1962 McGovern emerged as one of the leading opponents of the Vietnam War. In 1972 McGovern won the party nomination as its presidential candidate. Given little chance of winning against the Republican Party candidate, Richard Nixon, several leading politicians, including Hubert Humphrey, refused to be his running-mate. Tom Eagleton accepted but a few weeks later was forced to resign after it was leaked to the press that he had two spells in hospital for mental depression. He was replaced by Sargent Shriver. Harold Jackson has argued: "McGovern's campaign never recovered from the shifts and turns of this incident, but an already dismal performance was exacerbated by his rash promise of a guaranteed annual income for every American family. With no consideration of financial controls, he proposed a tax credit of $1,000 a year to every citizen. He was never able to give a convincing analysis of the plan, and it served mainly to outrage blue-collar and middle-class voters unable to grasp why their tax payments should apparently be offered to layabouts." During the election campaign there was a break-in at the headquarters of the Democratic Party at the Watergate complex in Washington. Reports by Bob Woodward and Carl Bernstein of the Washington Post, began to claim that some of Nixon's top officials were involved in organizing the Watergate break-in. However, this was not believed at the time and Nixon (46,631,189) had an easy victory over McGovern (28,422,015). McGovern was re-elected to the Senate in 1974 and in 1976 President Gerald Ford named McGovern as a United Nations delegate to the General Assembly. In 1978 President Jimmy Carter appointed him as a UN delegate for the Special Session on Disarmament. McGovern, whose autobiography, Grassroots, was published in 1978, lost his seat in the Senate in 1980 to a right-wing Republican Party candidate. For the next few years he was visiting professor at several institutions including Columbia University, Northwestern University, Cornell University and the University of Berlin. He also served as president of the Middle East Policy Council (1991-1998). 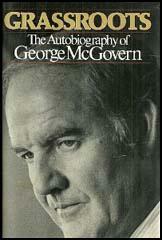 Other books published by McGovern included Terry: My Daughter's Life-And-Death Struggle with Alcoholism (1997), The Third Freedom: Ending Hunger in Our Time (2001) and What It Means to Be a Democrat (2011). George McGovern died on 21st October, 2012. In the long roll-call of characters involved in the Watergate scandal, there is usually one curious omission – the name of the intended victim. This was Richard Nixon's Democratic opponent in the 1972 presidential election, George McGovern, who has died at the age of 90. To this day no one has ever satisfactorily explained why Nixon's campaign managers thought it necessary to bug the Democratic national committee or indulge in other shenanigans that eventually brought the nation's first presidential resignation. It was clear throughout that McGovern had ensured his own defeat long before he took to the hustings. His problems began in the shambles of the 1968 Democratic convention in Chicago, which had gathered in the wake of President Lyndon Johnson's withdrawal from the election and the assassination of his likeliest replacement, Robert Kennedy. Racked by prolonged demonstrations against the Vietnam war and the violent police response, the delegates barely seemed to understand what they were doing when they voted at 1am (after seven incomprehensible hours of procedural wrangling) to accept a minority report from the rules committee. Against the advice of the committee's majority, this report stipulated that each state's Democratic party should give members "a full, meaningful and timely opportunity to participate in the selection of (convention) delegates". No one had the least idea what this meant, but McGovern was appointed to head a reform commission to flesh out its pieties. Though Kennedy had once described him as "the most decent man in the Senate", McGovern had already demonstrated a serious personal failing – a need to be all things to all men. Several times during his Senate career he had made mutually incompatible deals with other legislators, and thus made enemies of those whom he had let down. Under his weak chairmanship, the commission, most of whose members lost interest in its arcane disputes and stopped attending, fell under the influence of a politically correct faction that vigorously transformed an ill-conceived aspiration into an electoral disaster. The new rules laid down that state delegations must set quotas to ensure that they fully represented the wider community, particularly in the proportion of women, black people and young people. It may have been socially admirable, but it brought mayhem. In many states the rules were used by leftwing activists to discriminate against the white males who comprised the administrative core of the party. Such manoeuvres ensured, for example, that only 30 of the 255 Democratic members of Congress managed to secure accreditation to the 1972 convention in Miami. Even more damaging, none of the party's big city mayors – already endorsed by huge electorates in Los Angeles, Chicago, San Francisco, Boston, Detroit and Philadelphia – survived the new process, and the trade union barons were equally cast out. The practical outcome was organisationally disastrous. The Democrats had dumped the old-timers who had experience where it mattered most, those who had organised the anonymous thousands who set up meetings, stuffed envelopes, canvassed back streets and got the voters to the polls. When the new-style delegates overwhelmingly nominated McGovern as their presidential candidate, the AFL/CIO trade union federation, still smarting from his failure to vote as promised on an important closed-shop amendment, flatly refused to endorse him.